Economists have not always been on friendly terms with scientists from other fields. More than once, economists have been accused of 'imperialism' or criticized for neglecting the insights obtained in other fields. The history of economics, however, yields manifold examples of interdisciplinary 'borrowing' where economists have adapted concepts and theories from other fields. 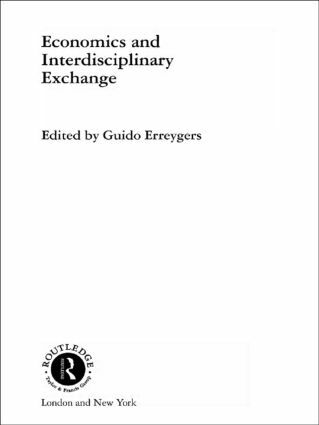 This book deals with the exchanges (or sometimes the lack thereof) between economics and neighbouring disciplines. the relationships between economics and policy, and economics and 'common sense'. With contributions from leading specialists, this volume will prove essential reading not only for those working in economics, but also those interested in the possibilities of disciplinary cross-fertilisation in any subject. Guido Erreygers is Professor of Economics at the Faculty of Applied Economics (UFSIA-RUCA) of the University of Antwerp. His research interests include history of economics, linear production theory, inheritance, and natural resource economics. With Toon Andevelde he has edited the book Is Inheritance Legitimate? (Berlin, Springer, 1997). He has published on the history of economics in various books and journals.